On the surface, the message in this picture may seem reasonable, but it isn’t. In fact, it is deeply flawed, mostly because it is based on fallacious reasoning. In this case, Randy Barnett has purposely constructed his statement so that it affirms his conclusion. You cannot do that — not according to the rules of logic, anyway. You especially can’t do it when — as in this case — you have based your conclusions on a false assumption. But more than this, the fatal flaw in this statement flows from the fundamental flaw of the Libertarian ideal: that there shouldn’t be any laws at all. If you will indulge me, I’ll do my best to explain. First, Barnett claims that the belief that punishment can restrain criminal activity is ‘utopian’ in nature. By definition, utopian means that it is not possible: that it is a fantasy with no founding in reality. If we are intellectually honest, we shouldn’t have to go very far to find objections that prove this claim false. Just think back to your childhood. Did you ever not do something because you were afraid of getting caught and punished? If you try, I have no doubt you can think of many examples where behavior can be and actually is controlled by the threat of punishment. If you need an extreme example, there is always Ahmadinejad’s claim that there are no homosexuals in Iran. Now, I am not claiming they do not exist simply because it is against the law there, but I am telling you that you will not find anyone openly admitting to being homosexual in Iran. The point here is simple: as to the first part of his claim, Barnett is demonstrably wrong! The threat of punishment does reduce crime — period. In fact, I would argue that libertinism is actually what the vast majority of our social media means when it claims to promote and defend individual liberty. It is all about the desire to be free from the consequences of our individual actions. For example: how many people do you know who believe drinking and driving, and second hand smoke are both harmful to others, yet smoking pot presents no harm to themselves or those around them? I can provide many similar and equally valid examples if you need them, but then, I am proceeding under the assumption that you are being intellectually honest here — at least with yourself. 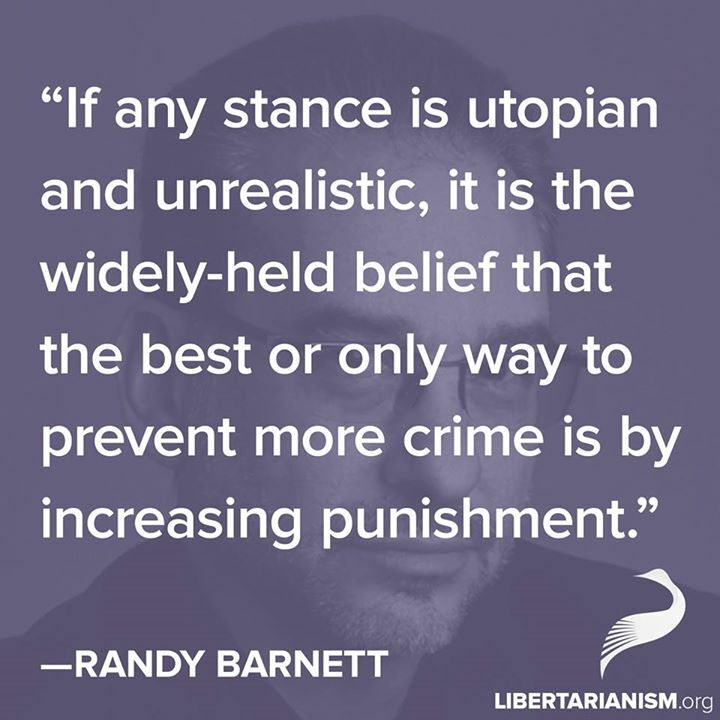 Well, that sounds nice, but this is a utopian ideal, not the belief that punishment deters crime. For one thing, if the individual is left to decide what is or isn’t right, then society will be faced with a different notion of what is right and what is wrong for every member in it. In short, we would run smack into the problem I wrote about in my post, The Creator: a Necessary Fallacy. Even then, we are still dealing with laws and punishments, it’s just that we are dealing with God’s laws and punishment. This only serves to drive home my point about the flaw in Barnett’s words. According to Scripture, God commands death for certain crimes, and repeatedly, we are told that this is so that we can “remove the evil from among us!” Now, where is the allowance for the death penalty in Barnett’s words, or anywhere in the Libertarian ideal, for that matter? I’ve looked. I have yet to find it, but I have found countless Libertarian arguments against the death penalty — which brings us back to the reason I am not alone in accusing Libertarians of being libertines in disguise.